It has been a year characterized by record high prices, record low inventory and wild swings in activity. 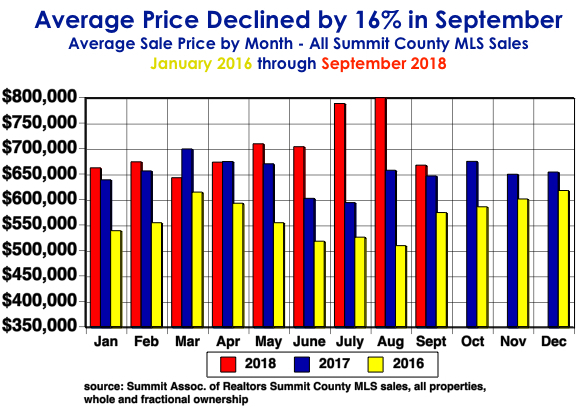 For the first time in history, the average price for Summit County properties climbed above $700,000 and stayed there for four consecutive months reaching nearly $800,000 in August. The July average price was 33 percent above the previous July. Yet September brought the average down by over 16 percent from August and many price reductions appeared. Once again, for the entire year, the inventory remained at alarmingly low levels, beginning the year at about 500 properties for sale and never rising above 780 properties of all types for sale at one time. In 2017 the inventory peaked at about 900 properties. In contrast, 2010 saw over 3000 properties for sale in the depths of the Bush Depression. 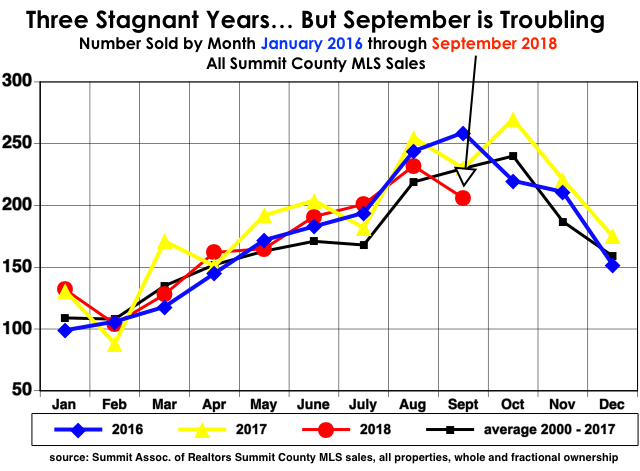 On the morning of October 5 there were 64 residences priced under a half-million dollars for sale in Summit County. There were 233 properties priced under $1 million. 1073 properties priced under $1 million had sold to that date. See the problem here? As a result, the average sale price is 98.9 percent of list this year and it is taking an average 71 days to sell and close a property. It is concerning that the market is in its 4th year of stagnant sales. There will be another 2150 or so properties sold this year, still stuck in the same 2100 to 2200 sale range that began in 2015. This is partly because of the lack of inventory, but buyer resistance to current prices is becoming a factor. Buyers who have been waiting months for availability in their preferred locations find that new listings are more expensive than when they began looking. And then they sell in days. Potential buyers are being discouraged by these prices. Current owners aren’t selling because many want to move up to a larger or different type of property. Besides there being nothing available, even selling at the highest price in history for their property won’t pay for the replacement. So they are stuck. The market is left with sellers who are buying elsewhere for less money, those whose lives have changed and don’t need a second home any longer or for whom selling makes economic sense in paying for college or retirement. Rising interest rates have had some effect, but half of our market is cash sales. Interest rates affect mainly first time buyers and primary residents, a small part of the market. Rising prices have made that segment e ven smaller. Record stock market levels have caused some investors to take money off the crap table and put it in real estate, hence the record number of $1 million plus sales. The average Summit County single family home is now worth over $1 million. So we’ve got marginally more buyers than sellers, nothing for sale to speak of and prices at historic highs. The odds of all these factors remaining in place for very long are low. At some point, a bunch of owners will decide to sell because of a stock market correction, recession or some change in the economic cycle and supply will equal or exceed demand for a while. When this happened in 2009, it took several years to recover to the previous price levels. The number of sales never did recover. But through all of the cycles, the fundamental force that keeps our prices high is lack of private land in Summit County. The 15 percent of the County that is private is nearly all built. That’s why you see so many structures being demolished and new construction going up. It’s often the only way to build. 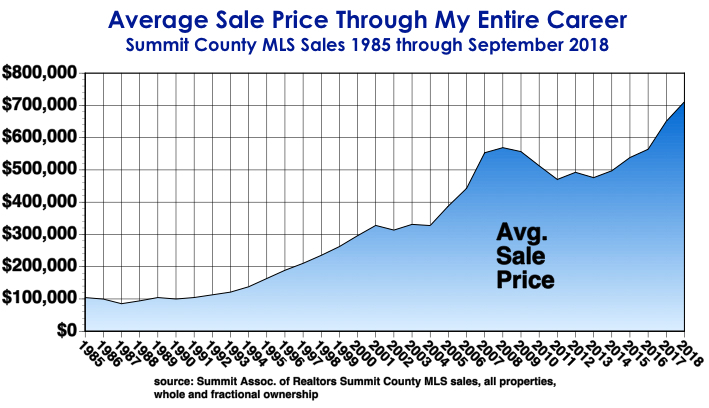 Cycles will come and go, but the basic value of Summit County real estate will remain, just as it has for all of my three-decade career. When things look the most uncertain, back up and look at the big picture. Real estate is a long term investment and those who have planned well over the years, myself included, have profited greatly. This won’t change.